Wondering what a local in NYC does when a 7-year-old kid comes to visit? Read on! 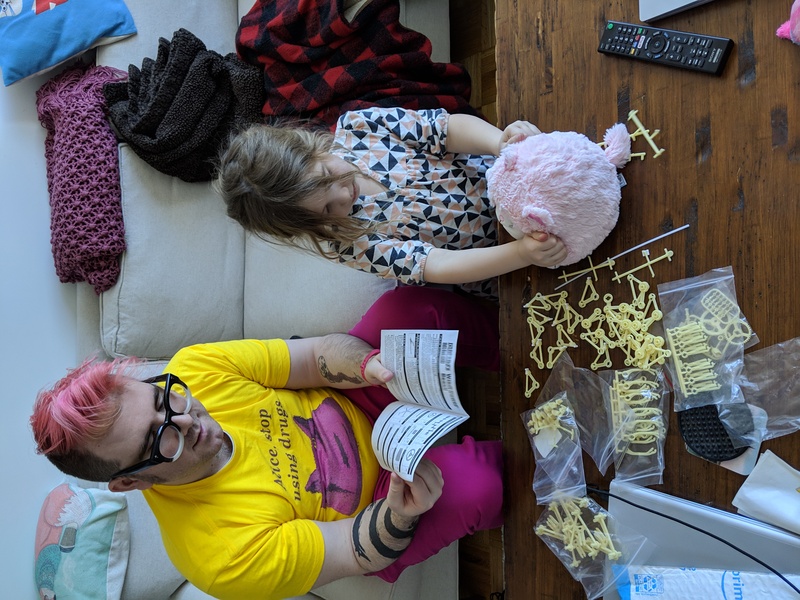 This weekend, my brother and our wonderful niece came to visit. 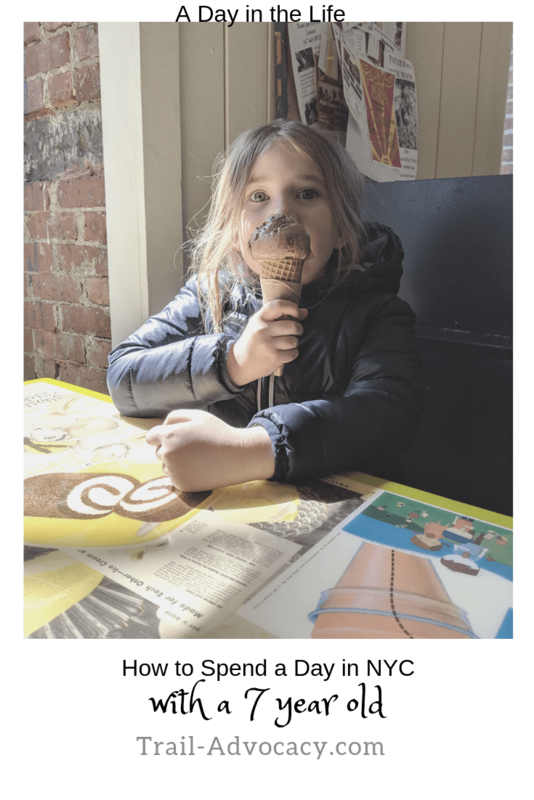 We don’t often experience NYC with a kid, so it’s always a challenge to decide what to do. Good thing this is no normal kid. My 7-year-old niece came saying she really wanted to go to the Brooklyn Museum to see the Friedo Kahlo exhibit. Crazy, right? Hey, when she demands, we oblige. Here’s what we did with our day. Neal and I love indoor rock climbing. We climb regularly at The Cliffs LIC. When we lived in Boston, we climbed at Brooklyn Boulders, but we switched it up coming to NYC. There are kids there every weekend, most often as part of a birthday party. We decided to take my niece to see how she liked it. She LOVED it, to say the least. She ended up getting to the top of most of the ones she tried, and some of our adult friends don’t even do that! Another fun activity she got a kick out of was walking the tightrope. I think she has a bright climbing future ahead of her! The quintessential NYC thing to do these days is go to brunch. They say if millennials could put the money they spend on brunch toward their savings they’d be completely out of debt. But who wants to be out of debt if you can’t get brunch?? Not a life I want. Anyway, most of the brunch places aren’t particularly kid-friendly. Usually they are boozy with wildly large portions. My niece said she wanted either french toast, oatmeal or yogurt, so we took her to CommuniTea. Communitea is a super kid-friendly cafe in LIC. It’s roomy, with games and some simple brunch options. My niece went with the yogurt with fruit and granola. She didn’t understand how anyone could eat an apple slice in yogurt, but happily lapped up the granola, strawberries and bananas. At this point, Neal and I needed a shower before our next move. Like all 7-year-olds, my niece is infatuated with Minecraft. She played with my brother on her tablet while Neal and I cleaned up. The big event my niece asked for was to see the Frida Kahlo exhibit at the Brooklyn Museum. She learned about Frida Kahlo from a podcast of all places. We had to oblige! We were going to take the subway, but it’s about 50 minutes and a 7-year-old has some trouble sitting still that long (or at least this one does!). My brother thought it would make more sense to take an Uber, so we ordered one and headed out. 100% the right decision. I’d never been to the Brooklyn Museum, so it was cool to visit a new place. They have an “OY/YO” sculpture out front right now. They put this up around election day to encourage voting (they were a polling place). But we were there for Frida! We headed to the ticket counter. When we got there, the line was crazy and at the beginning it said “Now selling tickets for 8:30pm.” We were so confused at first and then I went to the website. Apparently we underestimated the drawing power of the Frida Kahlo exhibit!! It was essentially sold out for the whole weekend. My niece was so disappointed, and boy did I learn a lesson. Get your tickets in advance folks! Since we couldn’t go to the Frida Kahlo exhibit, we did the next best thing: Got ice cream. But before we could go there, we had to walk by the Brooklyn Public Library and Grand Army Plaza. The Brooklyn Public Library is really nice and has a great kids’ reading room! Our kid didn’t feel like stopping once we got ice cream in her head, so we kept going. Nearby is Grand Army Plaza. If you don’t know, Grand Army Plaza has a memorial arch commemorating the Civil War. There’s a park behind the arch and it’s pretty nice just to hang out in this area. Behind the arch is also a fountain. In the winter, the fountain doesn’t run, but it’s still a great sculpture. My niece loves Greek and Roman gods, so the fact that Poseidon is on this fountain made her day. By the way, Prospect Park is right behind the Brooklyn Musuem and the Brooklyn Public Library. On a warm day, we would have stopped and had lunch there. The park is HUGE, but it’s really gorgeous. It’s a little more than half a mile from the museum to Ample Hills Creamery and this girl was ready for her ice cream. I told her it would be worth the wait. Ample Hills has some of the best and most interesting flavored ice creams, all made in-house. She ended up with a chocolate milk and cookies, I had a peppermint patty milkshake, Neal got a scoop of vanilla bean and a scoop of Mexican hot chocolate, and my brother went with a strawberries and cream milkshake. IT WAS SO GOOD. I so highly recommend it. Kids, as I’m learning, need a lot of breaks and downtime. To fill the second of our home breaks, my niece and brother put together a Wind Powered Beast! 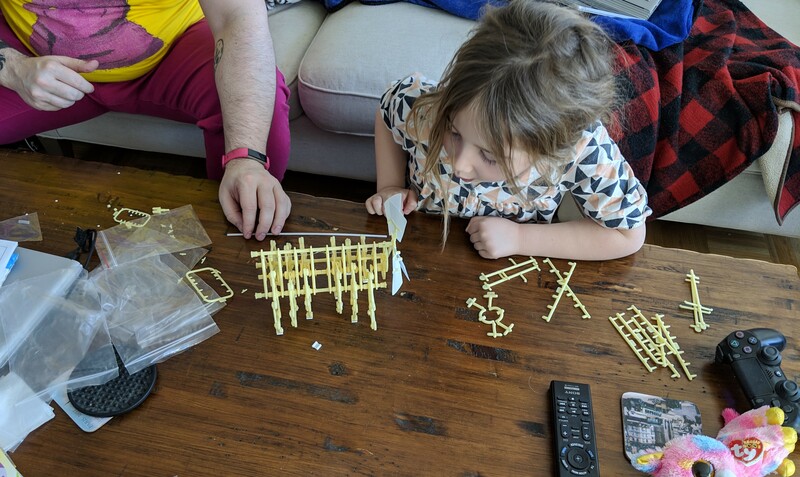 Then we played in the kid playground room in our apartment, played some foosball and watched Adventure Time–her ultimate favorite activity. We ate dinner at home because my niece is a picky eater. She went with noodles in butter and cheese. Now, we had already loaded this girl up with sweets, but for dessert she wanted (and her daddy approved) one more: a cookie from Chip. Chip is a local cookie store that started in Astoria (check out our post on Astoria here) and has moved its way down into LIC. They only have four flavors a day, but all of them are good. Sometimes, they do specials like cinnamon bun cookie or baklava cookie. You have to come early for those because they sell out! Welp, that was our day entertaining our 7-year-old niece in NYC. If it were warmer, we would have spent a lot more time outside, but no one can control Mother Nature when it is “spring” in NYC. 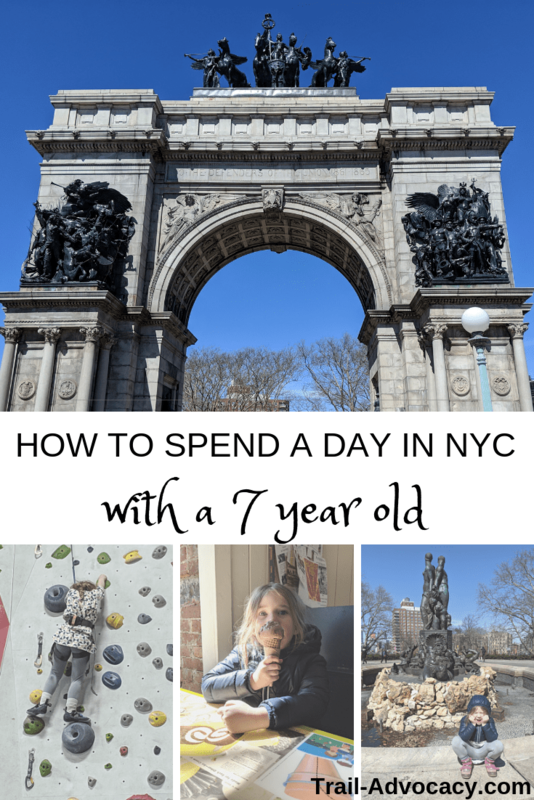 If you’re looking for something to do with a 7-year-old on a nice sunny day, go to Gantry Park! It is so so so nice and just a great place to hang out with kids (and dogs!). Next time my niece comes, we’ll be there!